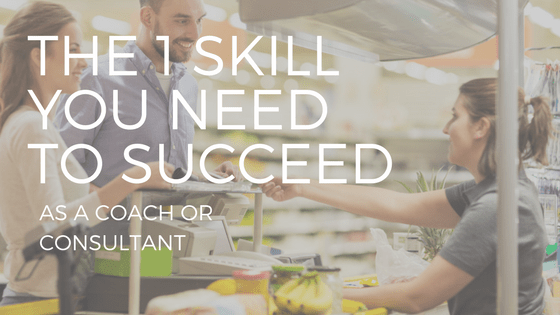 People frequently ask what skills are most important for a coach or a consultant. As recently as last week I was approached by someone asking me the very question I’ve been asked many times in the 22 years since I began my company, Strategic Pathways. You may be surprised to know my answer, in 22 years, has never changed. I take great pains to explain the 1 skill you need to succeed is comfort selling and marketing yourself. Of secondary significance is skill and competence as consultants, coaches or trainers. This is not the advice people want to hear, nor do they believe it. A wise person once said that every business is a sales business, and that industries differ only by the products or services they offer. I couldn’t agree more. It is my firm belief that all those who very publicly hang out a shingle and offer their services, only to very privately take those shingles down and return to what they had been doing prior, do so because they weren’t concentrating on selling themselves. They do not lack the skills, knowledge or talent in their field of expertise – they may in fact be world-class in their abilities. It really doesn’t matter how good you are at delivering your product or service if you have no one to deliver to. If your skills, knowledge and talent rank among the best kept secrets in the world, then your dream of building a thriving business is not a dream at all, it is an illusion. The ability to sell must rank as your most important skill, because it is that ability – more than any other – that catapults people and propels stellar organizations from mediocrity to greatness. There are no tricks to sales. It is hard work. Damn hard work. It mandates a willingness to always be seeking a way to connect. It means one must view rejection as nothing more than data to be ignored. It requires the determination to succeed at any cost. It is a profession for the brave and courageous few who dare to place their future, and that of their families, on their ability to convince others their thoughts and ideas are worthy. It hinges on their resolve to never quit when things get tough. Here’s why: things will always get tough. So what? Nothing worthwhile is ever easy. Interestingly, the most inspiring definition of leadership I have seen is the one that describes the most important trait of a great leader as being able to cause those around them to willingly go along with their thoughts ideas and suggestions. Sounds pretty much like the definition of a great salesperson. And we need many more of them.